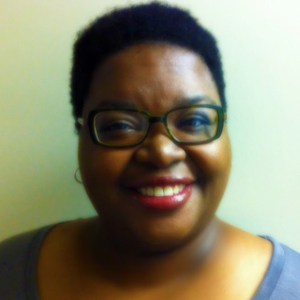 Adrianne Russell is a culture fan passionate about museums, education, and performing arts. She lives with her husband and two tuxedo cats in the Kansas Flint Hills (literally, “where the buffalo roam”). When she’s not adding to her must-see museums lists, she’s reading, writing, crafting plans for the zombie apocalypse, and dreaming of being a professional baked goods tester. Yes. I’m the Coordinator for Public Programs and Events at Kansas State University’s Marianna Kistler Beach Museum of Art. It’s a brand new position charged with developing experiences primarily in support of adult and student audiences, managing the museum’s social media and website, and arranging facility rentals. An undergraduate degree in Nonprofit Leadership Studies, National Certification in Nonprofit Management and Leadership, and a Master of Arts Liberal Studies degree with museum studies and new media concentration. If I wasn’t working in museums, I’d have a great career as a professional student. First, let me caution everyone against using Urban Dictionary to figure out what ‘sticky’ moment means. Having said that, it was when my sister got hired for an art museum job and I realized, “I love museums. Why am I not working in one?” Eight months later, I was. Cabinet of Curiosities. The site started in 2009. I blog mostly about museums, art, and nonprofit management. Those topics get a lot of play because they encapsulate most of the things that affect my career in the nonprofit sector. However, I fully reserve the right to post about the odd randomness I encounter on a daily basis, verbally geek out about museum visits, and wax poetic about how lucky I feel to do this work. My most read post is “No Professional Development Funds? No Problem!” I wrote it after spending a lot of time and energy whining about the lack of access to professional development opportunities as an emerging nonprofit professional. It’s a list of tips and tricks for taking charge of your career path and finding low-cost or free training. Elles: Women Artists from the Centre Pompidou, Paris at Seattle Art Museum, a survey of 20th Century women artists. My mind’s still reeling from that one. I was thrilled to see so many women represented in one exhibition, yet simultaneously pissed off that such a thing is still considered a rare experience. But it was done in such an engaging, provocative, humorous, and shocking way, I couldn’t stay mad very long. If you didn’t work in a museum what would you be doing? I’d be a librarian working with teens. I love reading and being around books and watching people discover stories that resonate with them makes me happy. I write young adult fiction, so having built-in focus groups at my job would be a nice perk. Where do you see museums in 10 years? Like many other historically-entrenched institutions (media, academics, government, etc. ), museums are slow to recognize when they’re in trouble. We’re living in an age now where people can “curate” (I know curators cringe at that but it’s how a lot of people frame it) and share their experiences. They expect the places where they spend their time physically and virtually to provide those platforms or, at the very least, access to them. They expect the “Sage on the Stage” to scoot over and make room. They expect museums to listen and respond—quickly and thoughtfully. These expectations will be even higher in ten years. Museums that anticipate these changes will respond by transcending their brick and mortar, fully embracing their role as community catalysts, continuing to discover new ways to meet their audiences where they are, inviting them to the table, and truly embodying what it means to be change agents rather than just paying it lip service. What do you see as the biggest challenge facing museums today? One of the biggest challenges facing museums is poor financial compensation. I don’t think there will ever be a shortage of talented people who are passionate about museums and want to work in them. It’s hard to maintain passion when you can’t make your rent, and retaining talent is difficult when salaries start meager and stay barely above subsistence. Museums can start by addressing the wide disparity between pay for its leadership and pay for its entry-level employees and encourage professional development opportunities for all so that talent can be grown from within. What a great perspective! Thanks for sharing your expertise on Meet a Museum Blogger, Adrianne. I’m glad you mentioned financial compensation as one of the biggest challenges facing museums today – I’ll be touching on this topic later this week! Great minds think alike! In case you missed it, Adrianne blogs at Cabinet of Curiosities. One of the things that sticks with me about Adrianne’s profile is something I’ve been thinking a lot about – that is, that there is no one clear path to successfully enter the museum field. Adrienne’s path took her through Nonprofit Leadership before she ever touched museum studies. Many museum pros never touch a museum studies degree at all… I wonder how that shapes the field? Keep an eye out, because this is something else I’ll be blogging about here in the future. Do you have any additional questions for Adrianne regarding her profile above? Is her path to the profession unique? How does it impact her perspective? Do you agree that financial compensation is one of the biggest challenges facing museums today? What about her take on the future of museums? Feel free to start a conversation in the comments below or reach out to her directly on Twitter. Her Twitter handle is @adriannerussell. I highly encourage you to use the #MuseumBlogger hashtag. TY! Tags: Adrianne Russell, Cabinet of Curiosities, Elles: Women Artists from the Centre Pompidou Paris, Kansas Flint Hills, Kansas State University, Marianna Kistler Beach Museum of Art, Nonprofit management and leadership, poor financial compensation, professional development opportunities, Seattle Art Museum. Bookmark the permalink. I agree about compensation being a challenge to the field – it’s a challenge in most fields right now, though. Workers across the board are earning low wages, getting part-time jobs or contracts that don’t provide benefits, and struggling. I think a lot of us come to the museum world as idealists who are not in it to get rich. But at the same time, we want to be able to get by. Some of us come to museums because we like the idea of knowledge and treasures being accessible to all, and along with that ideal, we want everyone to have enough income to survive – including ourselves. I can’t speak for everyone, but I speak for myself and people I’ve met in the museum world with similar ideals.